The Buddhist monk, Toby Gillies gives meditation classes and retreat days in Melbourne. The Hawthorn location serves Melbourne inner city and the eastern suburbs. Toby presents the methods of spiritual growth contained in the Buddhist teachings. He follows the Dalai Lama’s form of Tibetan Buddhist wisdom. There are weekly introductory meditation classes in Hawthorn on Tuesday evenings as well as Buddhist teachings. Periodic retreats form a comprehensive program of study and guided meditation. 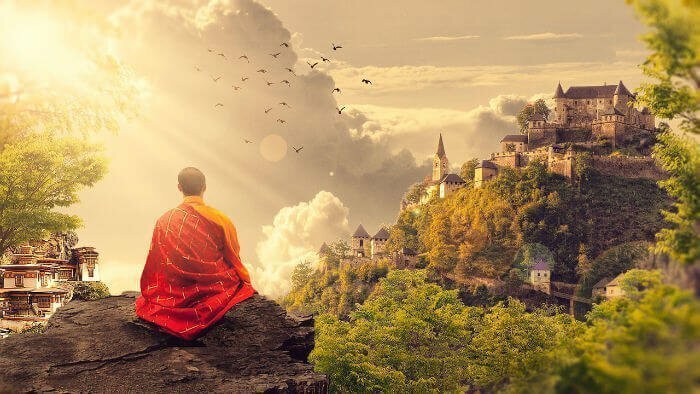 A quick look at where these teachings originate, from the Buddha himself to the present day, is set out below. A feature of the Tibetan approach is that the present day teachings come in an unbroken lineage. This lineage extends from the Buddha to his immediate ordained disciples, and them to theirs. It continued through the great scholar monks of India and Tibet, until our teachers today. So it is now that we see the beginnings of a transmission to the West. Toby Gillies represents the birth of the tradition into modern Western society. He presents a timeless wisdom for the here and now. A brief bio. of Toby is at the bottom of this page. Two thousand five hundred years ago an Indian prince left the palace of his youth. Prince Gautama Siddharta went forth to seek a solution to the suffering he observed. So he wandered and studied under the known spiritual teachers of his time. In time he realised he must find his own way and then practised meditation on his own. Through practise he perfected virtue and eliminated all faults. He attained Enlightenment, transcending all suffering and limitation. Thus, in the first truth he proclaimed the suffering experienced by beings to be the real issue. He was not interested in philosophical speculations about creation and the like. He valued a solution to suffering. In fact, his primary concern was human happiness. But a real happiness, an inner peace free from suffering. Ultimately, the actual counter to suffering and its cause is wisdom. This is an awakening to the nature of being and the phenomena of being. This ‘awakening’ or enlightenment and the path to it became the teachings, the Dharma. It gave rise to the Sangha, the spiritual community. These are the three jewels of refuge: Buddha, Dharma and Sangha. They have become the anchor and refuge for those who followed over millenia. In other words, there is the Buddha’s spiritual attainment by way of study and meditation. 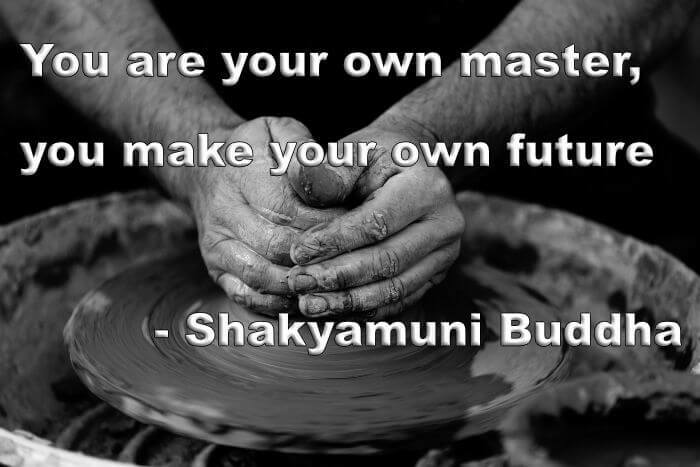 The path he taught is the Dharma, and those that practiced the path are the Sangha. All are essential aspects of a journey of discovery. They also give a means for waking up to things as they are, both within oneself and in the world that presents. After his awakening the Buddha went on to share his understanding. He travelled and taught others for the rest of his life. These Buddhist meditation teachings continue to this day in the various forms of Buddhism around the world. 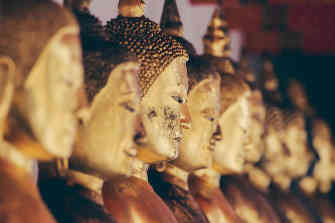 Over centuries the Buddha’s teachings spread through India and from there to the south and north. First came the southern schools through Sri Lanka, Burma, Thailand, Cambodia and Laos. They followed the traditional Theravadin approach. Then the northern schools developed in Tibet, China, Japan, Korea and parts of Vietnam. They followed the approach of Mahayana Buddhism. A common theme in the Theravada is an ethic of disciplined restraint. It is to hold oneself back from self indulgence, and causing harm. The Mahayana schools emphasised an altruism seeking the awakened state of enlightenment. They held enlightenment as the means to bring greatest benefit to all beings. A subset of the Mahayana developed an esoteric system of divine transformation. It aimed to bring about rapid enlightenment. This Vajrayana, or Buddhist tantra, became most popular in Tibet. A unique form of Buddhism flourished in remote and isolated Tibet. 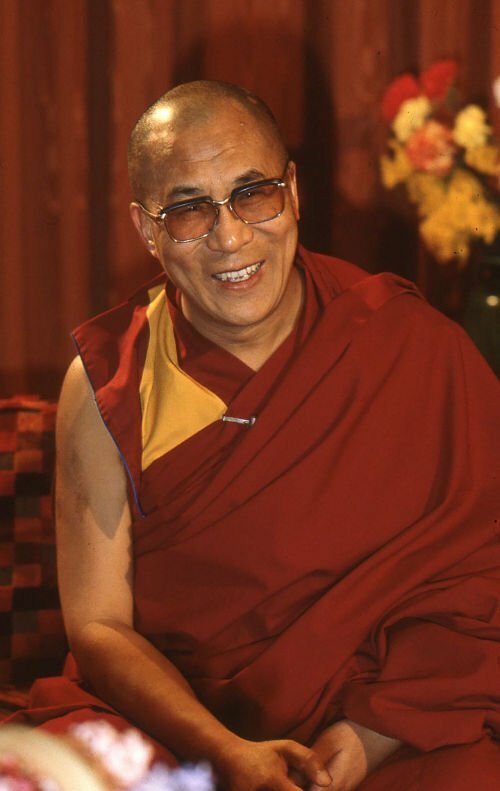 His Holiness the Dalai Lama has referred to it as a ‘complete form’ of Buddhist practice. This is because it contains elements of all the various forms. Hence Tibetan Buddhism includes the discipline of the Theravada. 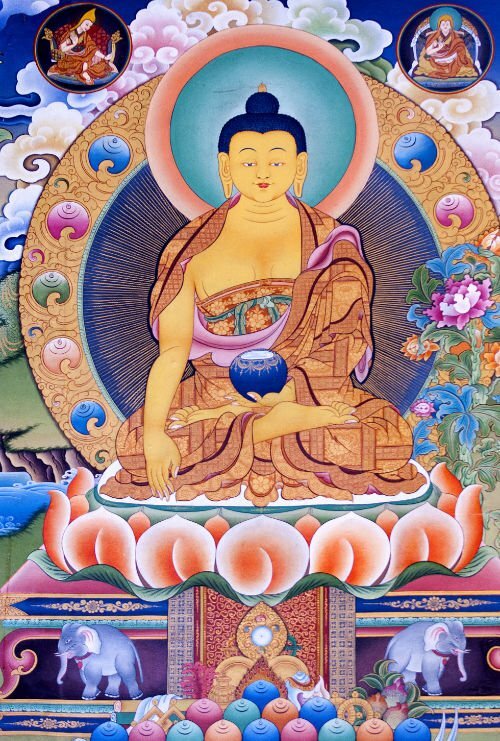 It encompasses the beneficial wish for Enlightenment of the Mahayana. These provide the foundation for the transformative yogas of its favoured Vajrayana. So Tibetan Buddhism contains elements of the all the various forms of Buddhism in the world. Over time Tibet’s monasteries became the greatest seats of Buddhist learning. Four main schools developed: Nyingma, Kargyu, Sakya and Gelug. The most recently formed is the Gelug, the lineage of virtue. It has the most adherents and seats of learning. The most renowned are the monastic universities of Drepung with 7700 monks, Sera with 5500 and Ganden with 3300 monks. His Holiness the Dalai Lama teaches Gelug in the main. The Gelug school has a rigorous scholastic system based on vigorous debate. Thus, scholar-monks spend as much as thirty years studying. They meditate on and debate the five major fields. The five are: Logic, Perfection of Wisdom, the Middle-way Philosophy, Metaphysics and Discipline. Completing these five, and their examinations, confers the revered title of Geshe. There is no real equal of this in Western academia. Over the last fifty years Tibetan Buddhism has proven a great influence in the modern world. This ancient tradition has contributed much to the fields of philosophy, psychology, neuro-science and a variety of disciplines exploring human potential. The sad events of 1959 had a silver lining. It gave the world their first real contact with the teachings of Tibetan Buddhism. Westerners began to establish centres and invite teachers. Thus in 1976, the great scholar-monk Geshe Thubten Loden arrived on our shores. He became the first resident Tibetan Geshe in Australia. 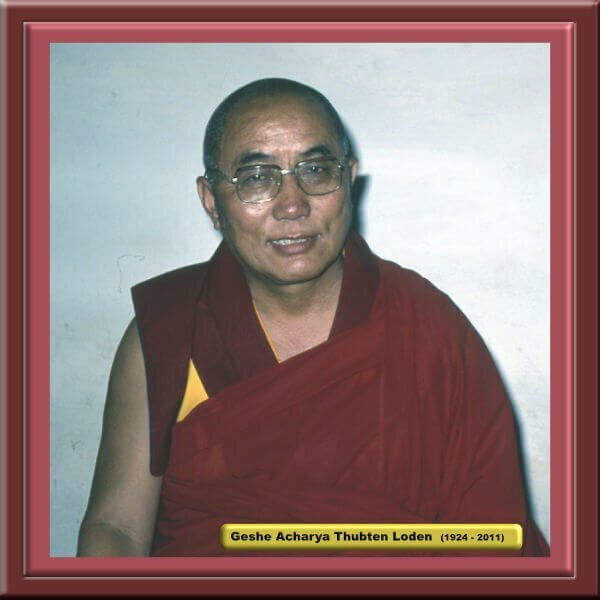 Over time Geshe Loden went on to form the Tibetan Buddhist Society where he taught until he passed away in 2011. He established the first traditional Tibetan temple in Australia in Melbourne. He then established a second in Perth. Geshe-la authored nine authoritative books. They present the essential theory and methods of practice of Tibetan Buddhism. Those who knew him well considered Geshe Thubten Loden to be a Buddha for our time. A man of immense compassion, he inspired thousands toward enlightenment. He cared for them in all aspects of their spiritual development. Geshe-la planted the seeds of Tibetan Buddhism in the hearts of Australian people. He helped them in the formative development of this tradition here. No doubt, his legacy will live for a long time. He is the revered teacher of Venerable Toby Gillies. Geshe-la put great thought and particular effort into the books that he produced. He aimed to condense the teachings most useful for Westerners. Geshe-la wanted them to gain the benefits of enlightenment. His three books on the Path to Enlightenment were that foundation. Geshe-la was a prince among scholars and graded highest of the high in his Geshe examinations. He approached teaching with the clear reasoning of a fierce debator. But his first priority was to help his students to engage in practice. His choice of subjects for his books reflect this. 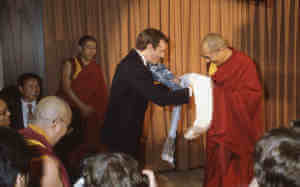 The Dalai Lama officially welcomed to Australia in 1982 by Toby Gillies for his first visit to this continent. Geshe Thubten Loden gave full ordination to Venerable Toby Gillies. 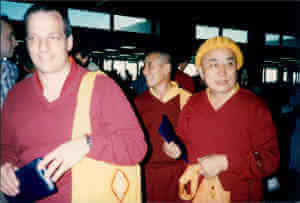 Toby had become his disciple when he first arrived in Australia and studied with Geshe-la for thirty five years. He was living, teaching and working with him in translating and writing his books. Through this Toby has developed a keen awareness of how the modern western person can enrich their lives with the wisdom of Tibet. Venerable Toby gives the classes and retreats set out on this website. ‘Why am I doing this? It is that I cannot watch the misery plain in modern life. Look at the intolerance, the harm, the abuse. What can we do? How do we fix the emotional turmoil, addiction and the absence of consideration. These sufferings are not necessary. We do not need them. The Dharma teachings show how to fix them and so much more. I am blessed to have discovered these teachings. They give a way forward to anyone, of any background, age, race or gender. So I am compelled to do what I can to pass on the solutions and teachings that I was so fortunate to have received. This solution is a simple change of perspective. So it is a new view based on wisdom, a wisdom that arises from the practice of meditation. Yet it is not only a solution to the stress and problems which afflict modern society. Also it is a path to realise one’s greater potential, to discover both obvious and hidden gifts. Through this we can share ever more joy, tranquility, love, bliss and rapture in every moment of life. © Toby Gillies 2019. All rights reserved.